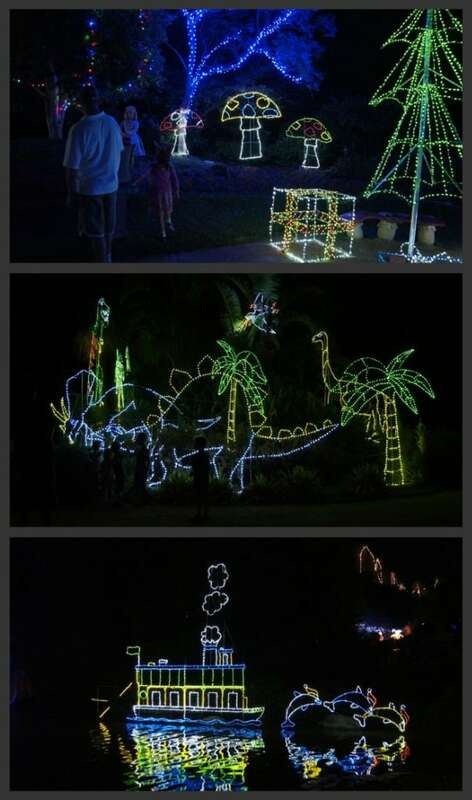 The twins and I went to check out the first night of this year’s Christmas Lights Spectacular at the Hunter Valley Gardens last week— and yes, it really is spectacular! We have some pretty exciting lit-up streets near here, and we’re not averse to a few strings of fairy lights ourselves. But a million lights… now that was something very special. We arrived at 6.30pm and enjoyed something to eat and turns on the amusement rides. Then the light display started at 7.30pm and we slowly walked around the special lit route through the gardens. We got to enjoy lots of the garden, the kids were utterly entranced by the Storybook Garden which is ideal for children their age as well as older and younger. We hadn’t been to the Hunter Valley Gardens before, although we had read about them and had it on our list of groovy weekends away. The Christmas Lights Spectacular is in its fifth year now and is the biggest Christmas lights display in Australia and, indeed, in the southern hemisphere. The variety of lights is really quite amazing, and by the end of the walk, we absolutely believed there were a million lights there. Maybe more! Some lights were synced with music, other flashed, sparkled and danced all by themselves. 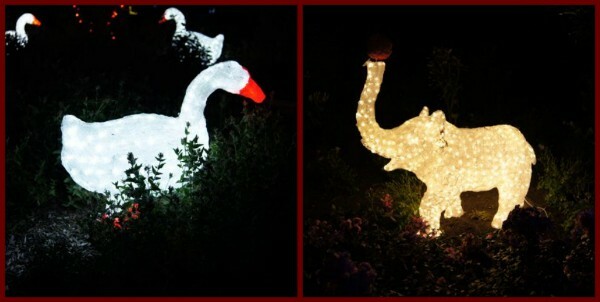 We were all totally entranced by the wonderful animals we saw, how gorgeous are the duck and elephant below! The twins and I stayed until 9.30pm, which is well past their bedtime but was well worth it. They were so bedazzled that they forgot to fight with each other, so that was a very welcome bonus for me! Cost: $12.50 for children aged four to 15 years, $17.50 for adults, family tickets available. 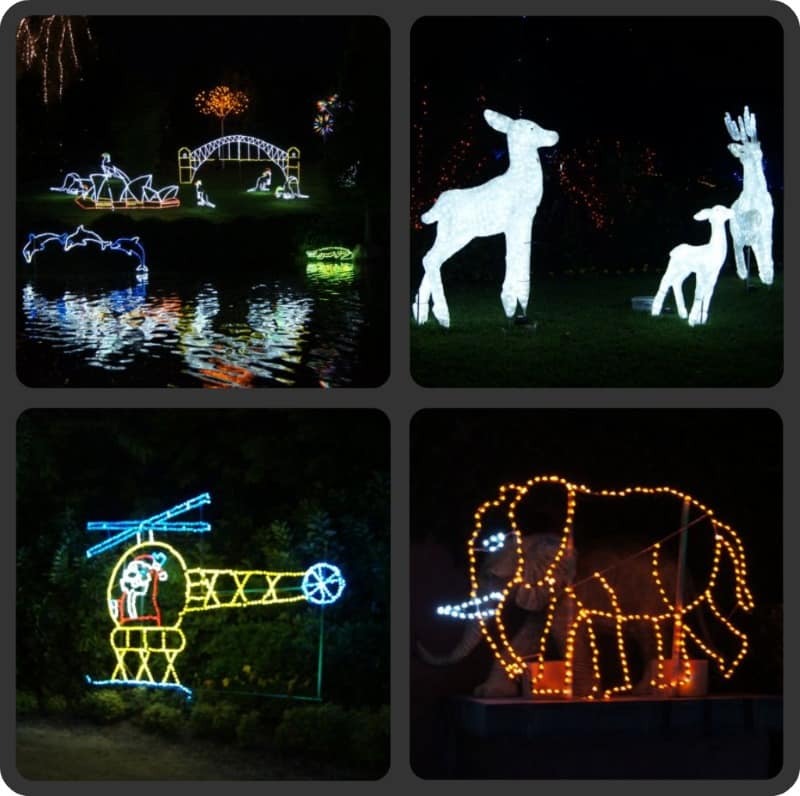 If you have been to the Gardens during the day then the cost for the Lights Spectacular is only $10 for adults, free for children. Accomodation: Closest accomodation is Harrigans Irish Pub (packages available) or the Mercure Resort, see also Wine Country website. Extra: The kids really enjoyed some of the fairground rides and the jumping castle. There are two song and dance shows for the kids each evening. Santa is there and very jolly and welcoming each night, he loves having his photo taken. Unfortunately my little daughter was too overwhelmed by His presence and we didn’t have a chance to say g’day. That’s it for just now. Do think about a visit, it really is a thrill for the children and for the inner child within we adults. I have also posted a video review from the kids, plus a review and video of the accomodation at Harrigans Irish Pub where we stayed. But first I need a little child-free time to get that done. Hello Monday. Do you love Christmas lights? Do your children? Where else would you recommend readers to visit? We were thrilled to be invited to visit the Hunter Valley Gardens and to be so well looked after at Harrigans. Many thanks! Yenie at Our Fun In The Sun has posted some great photos of the Gardens by day here. The ‘Yes, It’s Very Dangerous…’ One Minute Video.. I meant to add that I tend to put up our Christmas lights very late compared to most folks… our neighbours have theirs up already… I tutted when I went into the local shops and they had decorations up… but maybe these Scrooge-ish tendencies may be waning. The kids have started pestering. When do you put up your Christmas lights?? I’d love to take my twins there – sounds awe inspiring.